This tour has been designed for guests who have already seen Florence and Pisa and want to escape to the Tuscany region. After a 1 hour and 30 min drive through medieval hill-towns and beautiful surrounding valleys, you’ll stop at San Gimignano, an enchanting medieval village that has taken the name of the Bishop Gimignano, who saved the City from the barbarians. Also known as “The Town of the Fine Towers,” the town is so called because fortified walls and watchtowers were hallmarks of power and prosperity in the Middle Ages. Thirteen of the town’s original 76 towers remain. You’ll have time at your leisure to explore with your driver and on your own, or shop. 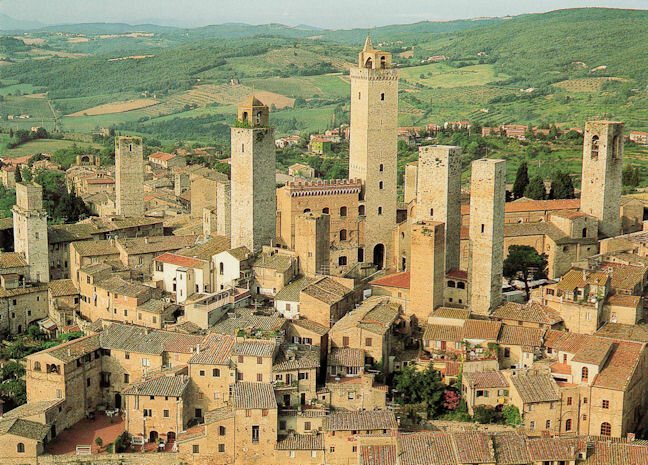 Take in San Gimignano’s sights, including the triangular Piazza Cisterna. The Piazza del Duomo is the site of the Collegiata, a Romanesque cathedral known for its fine frescoes. Driving west you’ll reach the village of Volterra in about 40 minutes. This hilltop town, as with so many others in the region, has roots that go back thousands of years. It’s a characteristic cluster of buildings with golden-stone walls and red tiled roofs, shaped by generations of inhabitants included the Etruscans, the Romans and the Florentines. Your independent exploration on foot will start at Piazza dei Priori, one of the most beautiful squares in Italy, and defined as a bellicose assembly of towers and palaces. Stroll to Piazza San Giovanni to admire the temples dedicated to prayer, the Baptistery and Cathedral. Enjoy shopping at leisure, for alabaster perhaps. Upon leaving Volterra, see the ruins of Roman Theatre (dating back to the 1st century BC), that was brought to life again only at the beginning of this century. This magnificent example of the flourishing Roman civilization could hold up to 2000 people. Guests must be able to walk moderately long distances, sometimes over cobblestone streets, with some steps and inclines. The Cathedral is closed on Sundays, during special events, and mass services. The return drive from Volterra to Livorno is approximately 1,5 hours, dependent upon traffic conditions. If you want is possible to have lunch at a Pecorino cheese factory. Ask to our booking office.